Did you have a nice break after Halloween, too? Well, the long awaited announcement for the winners is finally here! This new Orange Dotted Bikini Top that has never been in stores! She also gets 150 SoBucks. Congratulations to all the winners! I hope you all enjoy your prizes. Halloween is just around the corner! Enjoy this festively spooky season with these exciting contests. For two straight years, this contest has delivered chosen Socians a chance to pick one of two prizes. Here’s how to join! 1.) Send your apartment address and full SocioTown name to my email at dawn @ sociotown (dot) com. You can also send your address to my forum inbox or in-game inbox. If you don’t have an apartment, you can just have the park as your location. 2.) 10 lucky Socians will be randomly picked two days before Halloween. Be sure to check the blog and the official Facebook page to see if your address has been picked. 3.) On Halloween night, from 6:00 to 7:00 PM Socio time, I will visit the 10 Socians in their apartments. 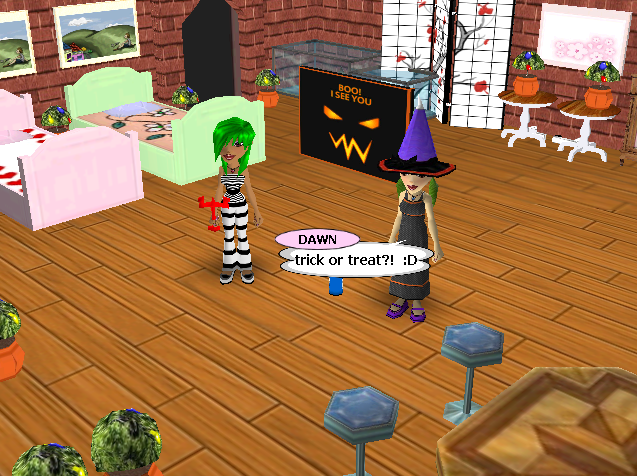 It’s important for the player to be there since I will ask the winning Socians to pick trick or treat. The prize will depend on the answer. The 10 winning addresses will be announced a day or two before Halloween, so winners can fix their schedule in advance and can make time to be there in the game. If you are not there within the time period, I will move on to the next address in the list and give your spot to another entry. 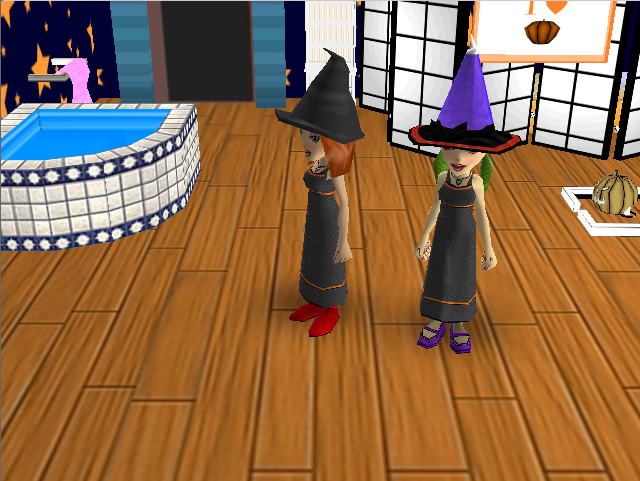 Waltz your Halloween night away with your lovely and charming, albeit spooky, Halloween costumes! Here are the contest details. 1.) Come up with a Halloween costume for the contest. 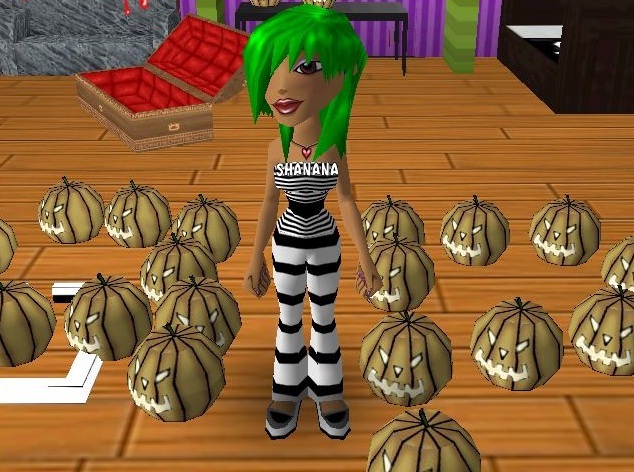 Follow the theme, which is Halloween Ball, to increase your chances of winning. 2.) Snap a screenshot of your costume. Here is a handy tutorial found online. Make sure that your image is clear and the outfit can be properly seen. You can either snap a screenshot by viewing your online profile or by using Theater Mode in the game. (Send me a message if you have any questions regarding taking a screenshot, online profiles or theater mode). Solo Scare - For those who want to join the contest alone. Candy Couple - For those who want to join the contest with their special someone. Fearsome Friends - For those who want to join the contest with their best friend or with a big group of friends (limit of four participants in an image only). You can join all the categories, but you can only win in one. 4.) Send your entries to my email address at dawn @ sociotown (dot) com. Include the category you’re joining, full SocioTown name(s) and the Permanent Resident status of the participant(s). Example below. 5.) Each category will have a winner. Depending on the number of PR and non-PR entrants, there will be a winner for each status too. Winners will get 150 SoBucks each. Time to get creative with your images! This time, you have to scare your Sponsor! 1.) Snap a screenshot according to the theme. This round’s theme is for you to “scare” your SocioTown Sponsor. 2.) You can wear a costume, shout something, change camera angles–it’s all up to your creative ideas! 3.) Here’s a handy screenshot tutorial found online. Send your entry to my email address at dawn @ sociotown (dot) com with your full SocioTown name and PR status. 4.) Two winners will be picked, each getting 100 SoBucks. Swimsuit Mix & Match Winners: Sumayyah & Josiejoker! We’ve got two winners here who rocked the swimsuit look with their very own style! Congratulations to Sumayyah and Josiejoker! With a Green Bikini Top paired with a Yellow Ruffled Skirt and a matching Green Long Pig Tails hairdo, Sumayyah graces us with her very own Swimsuit Mix & Match outfit. Josie’s the name, and pink is her game! She has cutely matched her Pink Heart Swimsuit Bottom with a Cherry Slim Top, Pink Preppy Shoes, and a Pink Hat. You both get 150 SoBucks, cuties! Let’s Enjoy Summer One Last Time! Summer’s ending, but that doesn’t mean we have to be sad about it! Let’s enjoy one last summer fun, before the season totally fades away, with these contests. So if you just want to have some fun, instead of working to earn some SoBucks, this is a quick remedy for that. Bring me a super picture! This contest has been extended until the end of August, so it’s not too late to send in a super duper entry. Unlike a regular BMAP round, where only one entry can win, all entries submitted to this super round are eligible to win — so long as your picture followed the rules! Click here to know more details. See that blank bubble? It’s pretty blank, huh. But do you see that totally rare Burger Despot skirt? Now that’s what I’m talking about! If you want your very own Burger Despot skirt or pants, come up with a line for that blank speech bubble up there. Comment your entry directly to the image (it’s in Facebook) and the best two entries will be picked next week. More info here. The crystal waters of the lake district call to us… to get our beach wear and partyyyy! Mix, match, randomize and go fashionably crazy! Pair your colorful swimming suits with cute shorts, cool sandals, and more. Once you have come up with an outfit that you want for this contest, you can snap a screenshot (tutorial here) and send it to me (dawn @ sociotown dot com) OR inform me through email/pigeon mail/forum message that what you’re wearing is your entry (I will take a screenshot myself and then inform you — make sure you don’t change your outfit unless I inform you that I took a screenshot already). If you do email me your entry, don’t forget to include your full SocioTown name and your PR status (PR or Non-PR). Two winners from each category will be announced at the end of the month (two PR winners and two Non-PR winners). You can make it look like it’s always sunny and fresh in your room with a potted plant or two. With this contest, you can get creative with the plants! Design one room in your apartment to look like a garden. Snap a screenshot (tutorial here) and send it to my email (dawn @ sociotown dot com) or inform me that you have a room in your apartment that you want to join for this contest (I will visit and take a screenshot myself). If you happen to email me, don’t forget to include your full SocioTown name and your PR status (PR or Non-PR). One PR and one Non-PR winner will be picked at the end of the month. The winners will get a prize of 200 SoBucks! Here are the long awaited winners of this year’s Valentine’s Day Contests! Congratulations, lovebirds. 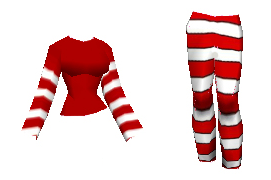 Malcomn’s outfit consist of the Red Mohawk, Lovestruck Shirt and Santa Trousers; Suzan45, on the other hand, wore (almost) all red: High-Waisted Red Pants and an equally red shirt, with White Heels to contrast it all. Their lovely hug is a cherry on top of this love-filled image! You don’t have to be a couple to enjoy Valentine’s Day, and these fashionable friends have proved it! They had tons of fun through picking and matching their outfits and by spending time together at the park. Even though Branwen is in the Friends Category, she only wins the Solo Category of this contest. With her feminine and daring outfits, she definitely deserves it! 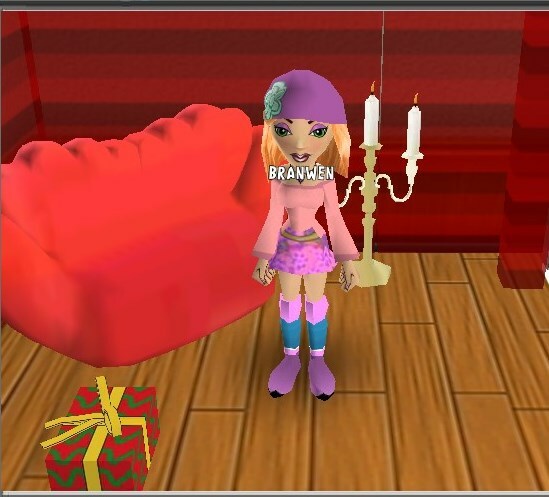 Even though that outfit made her win the Solo Category, Branwen also sent another outfit. Great enthusiasm, don’t you think? It’s a pity not to see it, so here it is! With her totally pink room, Rinadrummer had a mini party with her best friend, Zack! And that’s how she spent her Valentine’s Day. Pretty fun, huh! Your captions have earned you some SoBucks. 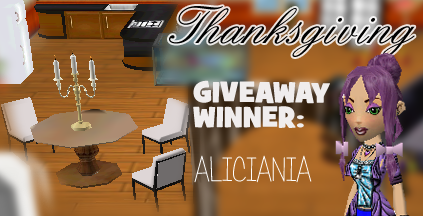 Congrats, Berta12 and Aliciania! And the contest that has a special prize has finally declared a winner. 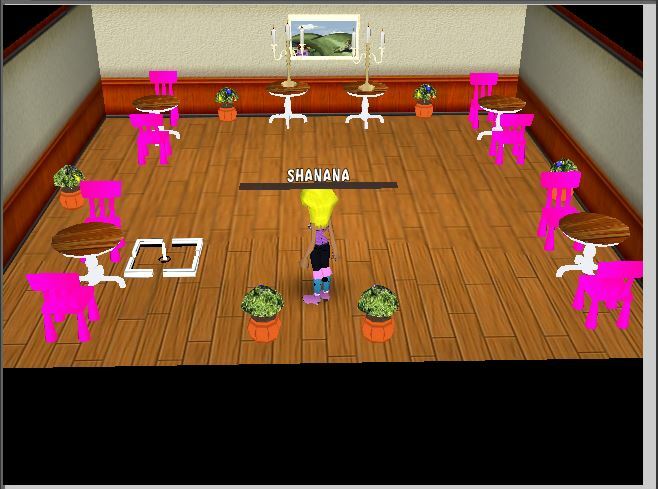 Congratulations, Shanana! Send me a message (through FB, forums, blog comment or pigeon mail) so you can choose one special prize. 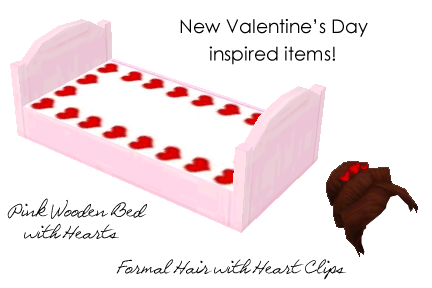 Choose between Formal Hair with Heart Clips or Pink Wooden Bed with Hearts. It’s love, love, love in SocioTown! Win the hearts of everyone by joining and winning these contests. It’s Valentine’s — dress for the occasion! Using red and pink clothing items, come up with an outfit that totally expresses the holiday. Whether your style’s cute, sporty or daring, there’s something for everyone with these three categories. Couples - This is for players who are in a relationship and want to join the contest together. Match up your clothes or be bold and daring with your combination — it’s all up to the both of you! Friends - Valentine’s isn’t just for lovers, you can celebrate it with your friends, too! If you want to join with your best friend, this category is for you. Maximum number of friends that can join you is two. Solo - Single and proud? Welcome aboard to the solo category! Rock out Valentine’s Day with your own show. Send your entries to my email address at dawn@sociotown(dot) com with the subject FS: Pink & Red, so I’ll know it’s for this contest. Include your full SocioTown name(s), PR status, category and a little description of for your outfit(s). For a clearer screenshot, please take a picture using the theater mode in game or through your online profile (http://west1.sociotown.com/profile.html?u=yournamehere). You can join all the categories, but take note that you can only win one. Deadline is on February 13, 2014 (update: contest is extended!) FEBRUARY 16, 2014. There will be two winning entries for each category, one for Permanent Residents and one for Non-PRs. Winners will be announced the next day and will receive 100 SoBucks for each participant. What’s your ideal romantic evening for Valentine’s Day? Is it a fancy dinner for two, a cozy movie night, or a party with the whole town? Show us how you’d spend Valentine’s Day with this special round of Room Design Contest! Design a room that shows how you’d like to spend Valentine’s Day. You don’t have to redecorate your entire apartment; one room is enough. Grab a screenshot or two and send it to my email address at dawn@sociotown (dot)com with the subject Romantic Date, along with your full SocioTown name, PR status and a little description of your room. Cut off for accepting entries is on February 13, 2014 (update: contest is extended!) FEBRUARY 16, 2014. There will be one winner for the PR category and another for Non-PR. Winners will get 120 SoBucks each! One Two captions will be picked! The winners will get 50 SoBucks each for their poetic feat. What’s your Valentine’s Day like? 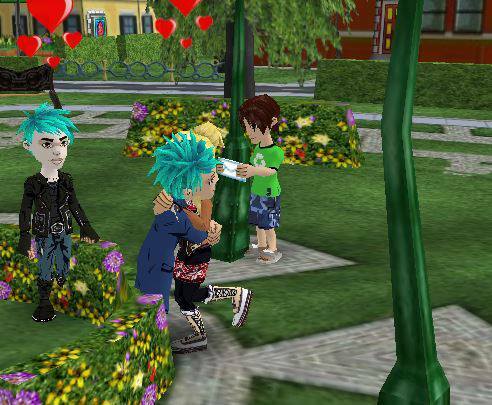 Is it a romantic stroll in the park, a wacky house party with all your friends, or eating fries at the park with the bugs? However you spend your Valentine’s Day, snap a screenshot and join Image Contest’s Valentine’s round! Send your screenshots to my email address at dawn@sociotown(dot)com with the subject My Valentine’s Day. Include your full SocioTown name and a little description of your entry. Deadline is on February 14 (update: contest is extended!) FEBRUARY 16, 2014. and the winner will get 100 SoBucks. This group of friends had a blast with their very own Christmas party. They had music, gifts, great decor and atmosphere, and loads of fun! Although this is a great picture already, the group also sent a couple more pictures that are worth a look. “I’m wearing the Casual Xmas Jacket, Red Santa Cap and the Red Flat Boots (I’m also wearing the Red Shorts but you can’t see them because my outfit is covering it :P). My reasons for this combination is, obvious, it’s red and white. Plus, the Jacket is the coolest one in town, fashionable, warm and totally Christmassy. The boots help me walk in the snow that’s going to fall pretty soon (latest by Christmas). And the Cap, well that’s to show the holiday spirit. The PR Giveaway winner will be in a separate post. Christmas 2013 - Contests and Giveaways! Are you ready to celebrate the holiday with these awesome contests? 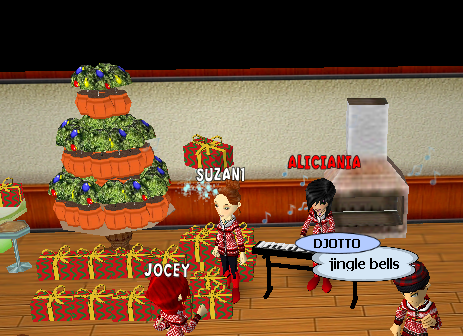 Throw a fun Christmas party and capture a screenshot of it! 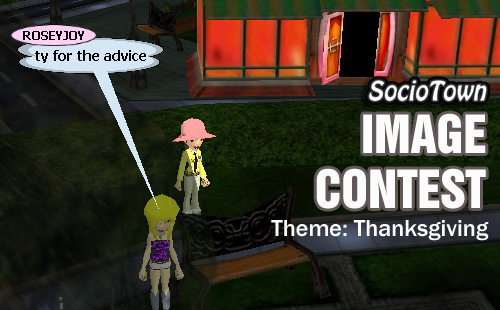 In this Image Contest round, you can join with three of your SocioTown friends. Show us how you would have a Christmas party at SocioTown — make it unique, funny, or simply creative. No edits are allowed in your entry, though. Cropping is alright, but not drastic editing in photo softwares like Photoshop or Gimp. To snap a screenshot, you can use this tutorial. 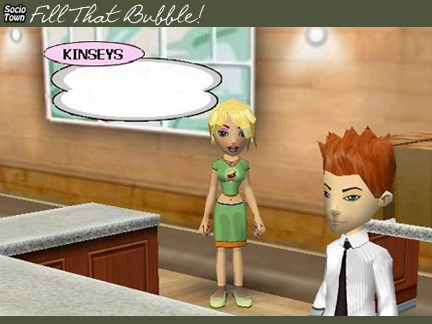 Note that SocioTown and OTBS are not affiliated to the website — it’s just a very handy website online. Send your image, together with your full SocioTown names, to dawn@sociotown(dot)com. You can add a little description about your entry. Use the subject “Image Contest: Christmas Party”, so I’ll know it’s for this contest. The winners will receive 100 SoBucks each! Deadline is on December 25, 2013. Choose clothing and hairstyles that are red and white, and mix and match them to come up with a fashionable Christmas outfit! To come up with a clear screenshot, go to your online profile: west1.sociotown.com/profile.html?u=(your name here without the parenthesis) and screenshot your look from there. 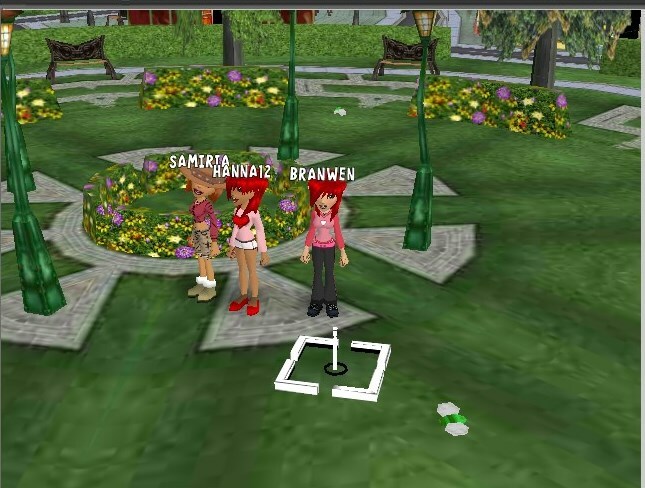 You can also choose to take a picture inside the game with a surrounding background of your choice, as long as your outfit can be clearly seen. Send your entry to my email dawn@sociotown(dot)com with your full SocioTown name, your PR status, and a little about your outfit. If enough PR contestants join, we’ll pick a male and female winner from the PR and non-PR categories. So with enough entries, there will be four winners (two male and female entrants from PR and non-PR categories). Deadline is on 25th December. The winners will get 100 SoBucks each! Want a free PR subscription for a month? Tell us why SocioTown Santa should grant your PR wish! You can post your entry as a comment here, in Facebook, or email me at dawn@sociotown(dot)com. Don’t forget to add your full SocioTown name. One winner will be chosen on December 25! Be a Secret Santa this year! 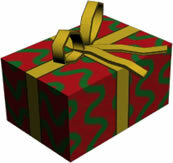 Share to us the name of your friend you’d want to give a gift to, and tell us why you want to give him/her a gift. Send your entries to my email at dawn@sociotown(dot)com or through a private message in Facebook or forum, or even in the game through pigeon mail. If you want to surprise your friend, let’s keep it private. Deadline will be on the 24th. On Christmas day, three Secret Santa wishes will be picked. Your friend will receive a random surprise gift! 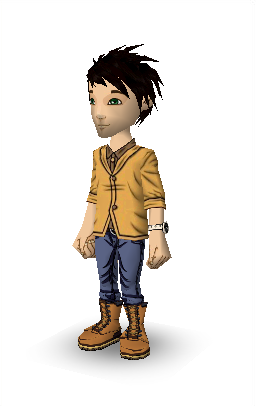 For this outfit, Michael22 matched the Casual Stylish Shirt with the Casual Winter Boots and Pants. His Black Messy Sideways hairstyle fits his overall look. The colors and style make it a great outfit for Thanksgiving dinner. You can even unbutton your shirt a little if you had too much roast and pie. Most of us might take our Sponsor for granted, but they are always there when we need anything. Got questions? Fire away! They’ll take you through, step by step. Lost in town? Just find your sponsor and you’ll find your way in no time. They got you in town, you can bet they’ll stick through you… except when your rent’s overdue. Kidding aside, it’s a good thing to remember them once in a while. Thanks for this entry, Alextechno. Good job! 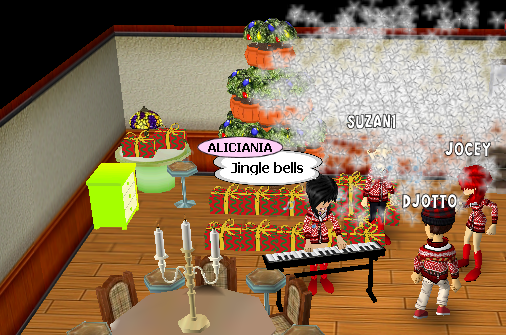 And thank you too, Aliciania. Enjoy your new Wooden Kitchen Counter Set! To the winners, you’ll get your prizes soon. Thank you to everyone who joined. Look forward to SocioTown’s Christmas contests! There will be 12 days to look forward to. 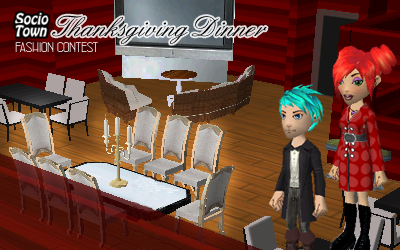 If you have a lot to be thankful for in the game, you can show it through these contests. Read more to know the rules and prizes.